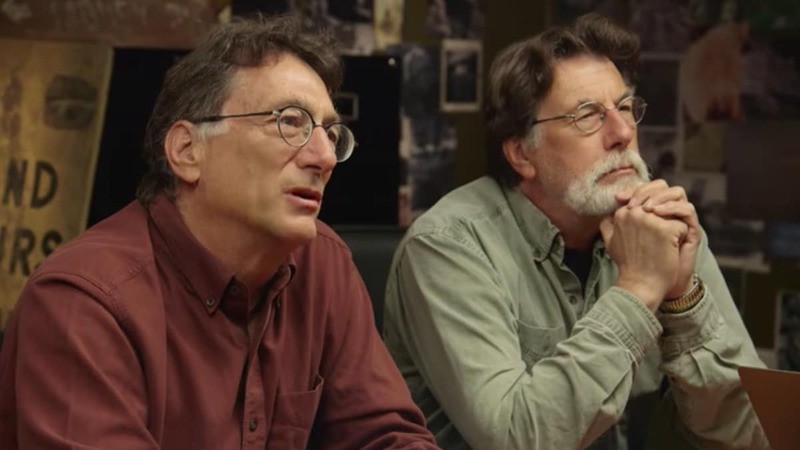 On The Curse of Oak Island this week, the treasure-hunting team led by Rick and Marty Lagina began by assembling in the war room to talk about the results of the dye test conducted in last week’s episode. 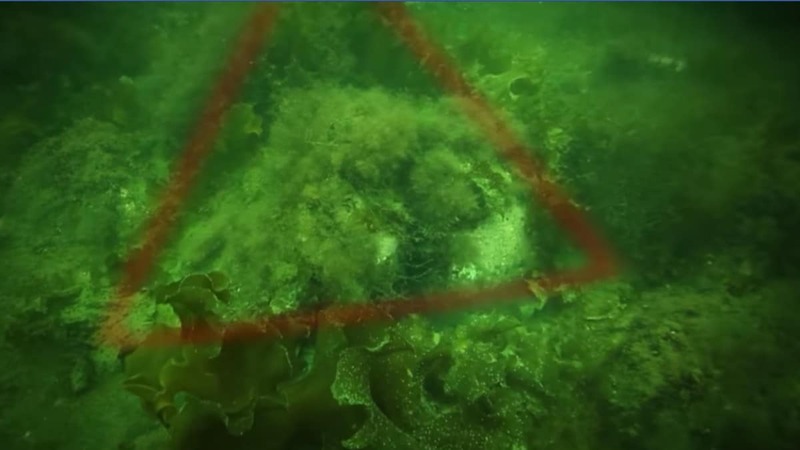 After the team pumped between a quarter and a half million gallons of water stained with florescent red dye to points on and around the island, they saw rusty seepage in Smith’s Cove that had not been there prior. Later, the rust colored water trickle tested positive for traces of the red dye. The team believe that this evidence indicates there is something significant underneath the crane pad in the cove, and hope that the finding is consistent with a plugged flood tunnel. 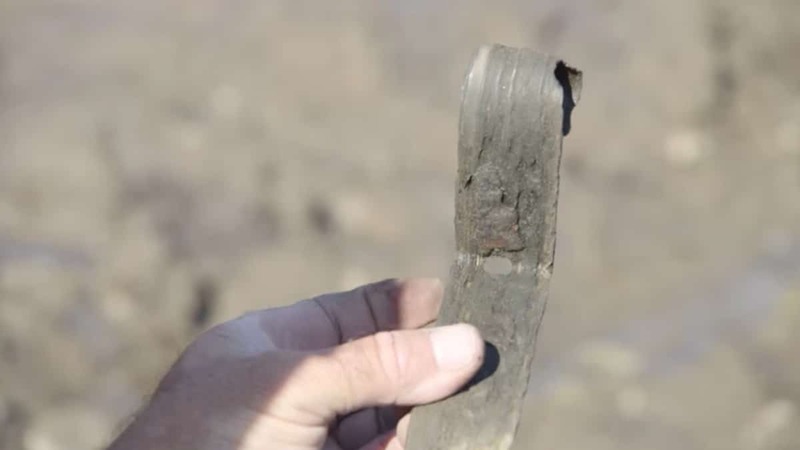 Metal-detecting expert Gary Drayton was the first to spot the reddish flow and noted, “All the rocks turned an orangey-brown color where water flowed over the rocks,” and that he had never seen that color in the area before. Because the crane pad is built over the spot that the team now hope to find a convergence point that leads to the Money Pit, they need to talk to Irving Equipment Limited before any further exploration can take place. Craig Tester concedes that digging underneath the pad would be “a pain,” but he wants to follow the water flow and get all of the work done that they can this year while the cofferdam is in place. The team agree that they want to verify if the main flood tunnel has indeed been found. But time is not on their side. They will need additional environmental permits in order to expand their excavation efforts, as well as securing an extension on the present permit if they want to keep the 525 foot cofferdam in place. With summer almost over, and their government permits set to expire, Rick and Marty acknowledge that they must move quickly to complete their desired work, including figuring out what numerous unearthed and undocumented structures represent. These include enigmatic L and U shaped structures, a concrete wall, a slipway and evidence of a stone box drain. Meanwhile, at Smith’s Cove, archaeologist Laird Niven announces that the entire slipway is now exposed. The next step is to disassemble the structure in order to search underneath for clues and artifacts. To date, no one is certain of the intended purpose of the wood configuration. Was the slipway a secret wharf that allowed for the unloading of valuable treasures on to Oak Island? It is hoped that whatever is found underneath the massive structure will yield conclusive answers. 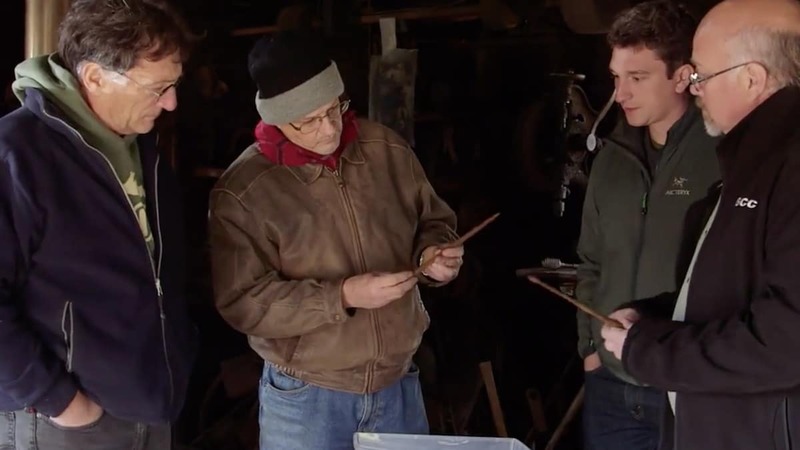 Also at Smith’s Cove, Jack Begley and Gary find several cryptic items in the spoils. 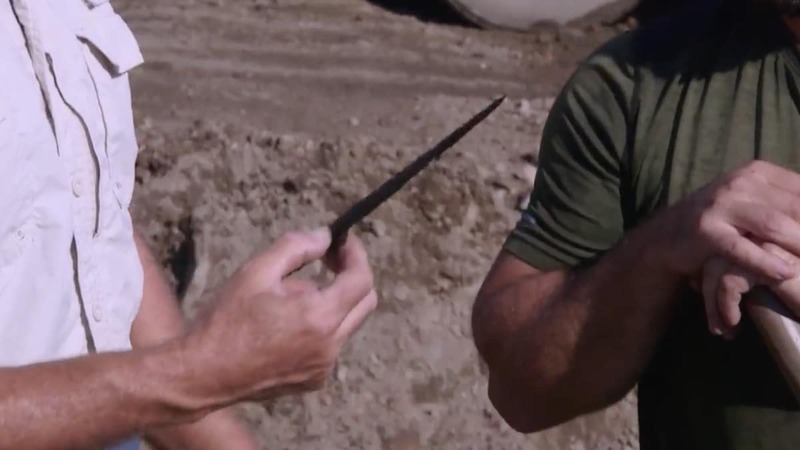 “Oh that is a beauty,” says Gary, “this looks old, this frickin’ reminds me of some kind of a spear point.” The long, slender metal object he has uncovered looks to him like a projectile of some kind, maybe a spear tip. Could it be related to a similar item Gary found four weeks ago? That object turned out to be a Roman pilum, something known to be used by Roman soldiers as far back as the 1st century BC. The spike being discovered by Gary in Smith’s cove. Next the team travel to New Ross to meet with blacksmithing expert Carmen Legge, in hopes of pinning down how many verys the hinge merits. Carmen is first shown the slender metal objects that Gary found. He declares them to be crib spikes, items used to make wharves, derricks, and platforms, and dates them to between 1650-1800. Could they have been used in the construction of the slipway? Just how old are two verys versus three verys? Carmen thinks the hinge dates to before 1800, possibly as far back as the early 1600s! In the Money Pit area the team meet with Irving Equipment Limited and Vanessa Lucido of ROC Equipment where two weeks ago borehole H8, believed to be above the Money Pit, began to collapse. In light of the bad news, they decide to return to their earlier strategy of reaching the rumored treasure vault by way of Shaft 6. Rick has high hopes, saying, “If there’s anything to be found in the Money Pit, it’s in that shaft.” In fact the team scored a success in the shaft when they found evidence of a 19th century searcher tunnel. 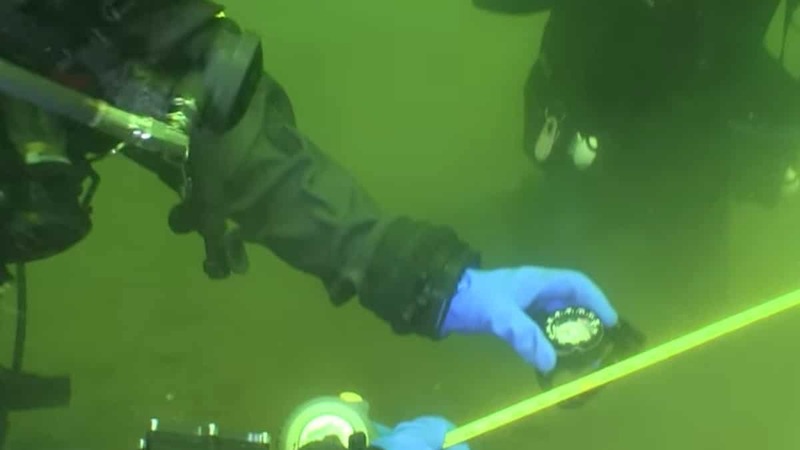 But when Alex and Tony dive into the ocean in an attempt to locate these mysterious items, they must deal with visibility of only 10-15 feet. Complicating matters further, the team only have permits to search for artifacts on land, so they are prohibited from removing or even touching objects in the water. Even so, while it is against the law to disturb any item they find, they are excited when they discover that they have located the triangular formation. As the show’s narrator Robert Clotworthy notes in a suggestive voice over, this could be a significant sign, perhaps even a marker to the treasure vault. A second dive is made to locate the presumed ship’s anchor even though the “weather’s turned to crap … the currents are much stronger than before,” according to Tony. “Good luck, but be safe,” says Jack. In the end, will the crib spike turn out to be the one thing needed to prove that the slipway was indeed put there by depositors? And if so, what was deposited? Could it be precious gold, priceless jewels, ancient artifacts, or perhaps something so unbelievable that it will change history forever? Be sure to tune in next week and find out! The Curse of Oak Island airs Tuesday nights at 9/8c on History. 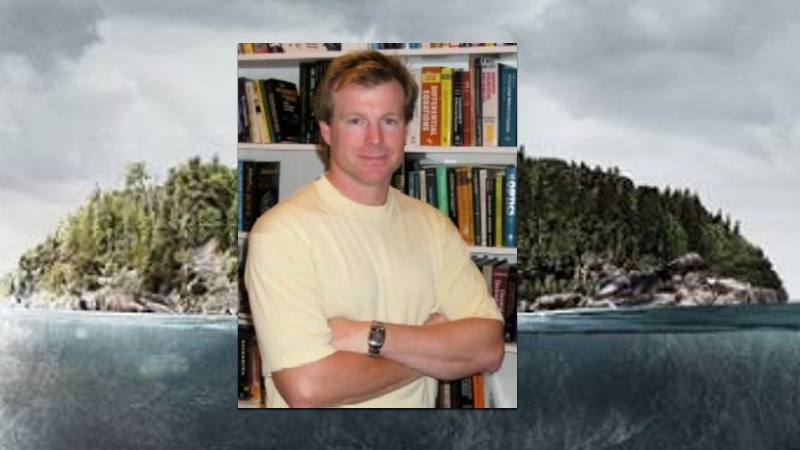 Travis Taylor: Who is astrophysicist on The Curse of Oak Island?